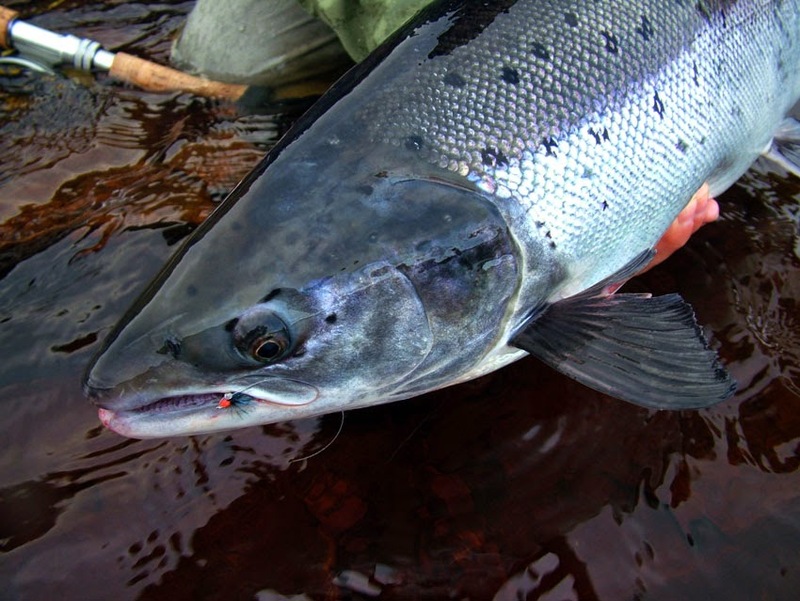 Chavanga Fish Blog: Promotional offer for trophy salmon fishing on the river Strelna! Promotional offer for trophy salmon fishing on the river Strelna! I want to offer you a special two weeks for salmon fishing on the river Strelna, on the Kola Peninsula in Russia. Each river has its own special week , special time for salmon fishing . These special two weeks - last week of August and first week of September is characterized by the fact that begins fall salmon runs in the rivers of the White Sea . At this time, especially large salmon that reach 8-12 kg weight comes here . It's not the easiest week for salmon fishing . They are not like a week in prime time - at the beginning of July or at the end of September. In the last week of August in the river comes not so much salmon as in early October. 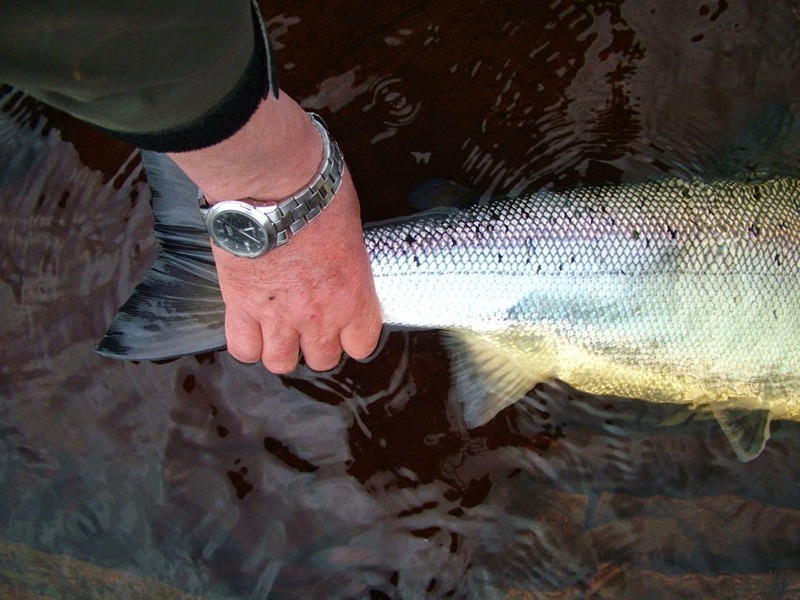 But salmon is quite a lot and really the biggest fish comes in late August , early in the northern autumn. Another advantage of these weeks - the relatively low cost of the camp at Strelna and respectively - the lowest cost of the tour. The first week ( Week 35 ) starts from 28.08 and ends 04.09 the second week (36) starts from 04.09 and ends 11. 09 . Accordingly days of arrival at the airport of Murmansk - 27.08 and 03.09 . If you are interested in this offer - please, contact me. Good luck ! The fishing season opens since May, 15th. The season end legally is not limited, depending on weather conditions it is possible to finish a season in the middle of October. To get to the Strelna camp is possible by the helicopter, by the truck or the powerboat by the sea. The Variant. Meeting at the airport of Murmansk. Delivery by a minibus to Umba takes 5 hours. Road to the mouth of Varzuga takes 3.5 hours by the off-road car. Then 3 hours to the river Chavanga and then 2.5 hours to Strelna. It is considerate as inexpensive and a reliable variant. The Variant. Meeting at the airport of Murmansk. Delivery by a minibus to Umba takes 5 hours. Road to the mouth of Varzuga takes 3.5 hours by the off-road car. Then by the powerboat to Strelna takes 1.5 - 2 hours. It is an inexpensive and convenient variant. This method of trasportation depends on weather conditions on the sea. The Variant. Meeting at the airport of Murmansk. Delivery by a minibus to Umba takes 5 hours. Than from Umba there is 1 hour flight by helicopter straight to Strelna camp. It is comfortable enough and fast way of delivery. A bit more expensive way of traveling. The Variant is a mix of helicopter (way to or back way ) and off-road car. Meeting at the airport of Murmansk. Delivery by a minibus to Umba takes 5 hours. Than from Umba there is 1 hour flight by helicopter straight to Strelna camp. Back way we start by the off-road car, minibus from Umba to Murmansk.